After asking if any of you out there had any info about this relatively unknown to me company, as I’m beginning to find i can trust in my readers! I had this cracking response from ex Manton’s driver Tim Speight. Tim you are a top man!! Now here’s a challenge can any one provide more pictures and for a big old pat on the back, can you furnish the UK’s top truck blog (view of Mr Ben Sheldrake not necessarily of any one else any where!) with a picture of a Mantons Renault Magnum??? My only picture response was from Neil Jarrold of www.euro-wheels.com . 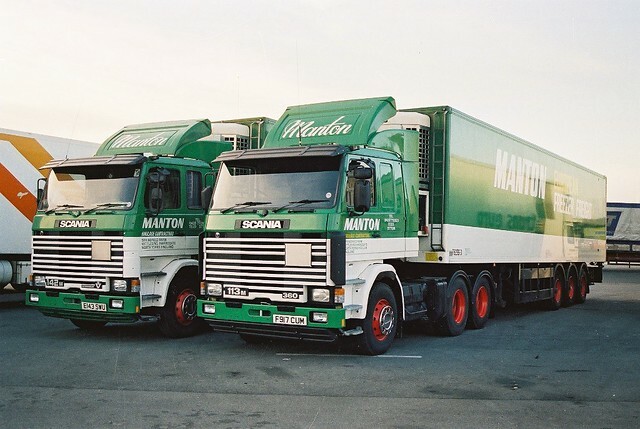 Neil has a picture of every truck that has ever driven on a UK road (well…..so it seems!) these 2 were snaped in Dover back in the late 80’s early 90’s i should think. If you have a spare day or 2 head over to www.euro-wheels.com and see what you can find. Picture is Copyright of Neil Jarrold.